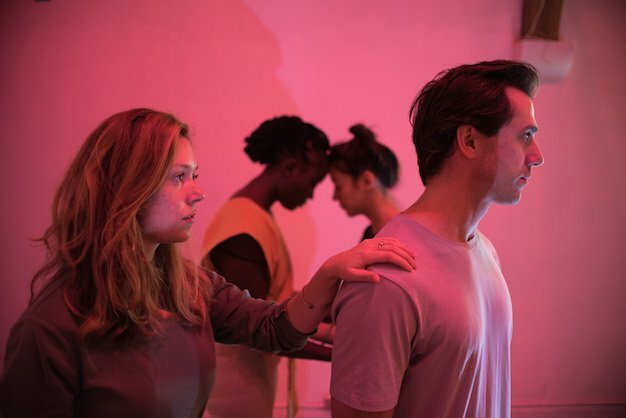 Outside the March’s TomorrowLove was one of the great theatrical experiences of 2016- a sprawling series of thematically linked futuristic two-handers performed simultaneously throughout an old funeral home by an extraordinary 8-person cast in any one of dozens of combinations of possible scene orders and scene partners. I saw the show twice, the second time just following Outstanding Supporting Actress nominee Katherine Cullen around because she was too captivating to walk away from. I was really little, probably like 5 or something. I grew up in Vancouver, so we had this thing called the Children’s Festival every summer, and my mum would take me. There was this clown named Gumboot Lollipop that I was completely obsessed with. I saw her and I was mesmerized. I didn’t really articulate anything- I wasn’t like “this is what I want to do”- but I remember being really, really drawn to what she was offering. Do you remember when you felt like “this is what I want to do”? Yeah. Honestly, it wasn’t long after that. I was really close with my grandmother, who was really, really sick. I remember just eating this piece of chocolate cake in front of her. I was going on and on about how great the chocolate cake was, and she was laughing, and laughing, and laughing. I remember feeling like “oh, this is so fun.” I was really little, so I knew she was sick, and I knew I was bringing her some joy. And I remember really liking the attention as well. So I had a clear thought of “oh, I don’t know what this is, but I know I want to do that”. Then I saw the Phantom of the Opera and Joseph and the Amazing Technicolor Dreamcoat when I was little. So it’s been a while, thinking these thoughts. You’re one of the founding members of Outside the March. Tell us a little bit about the genesis of the company and its founding principles. We formed- god, it would have been 7, 8 years ago now- in Edmonton. Some of us were living in Edmonton, some were in Halifax, and Toronto. 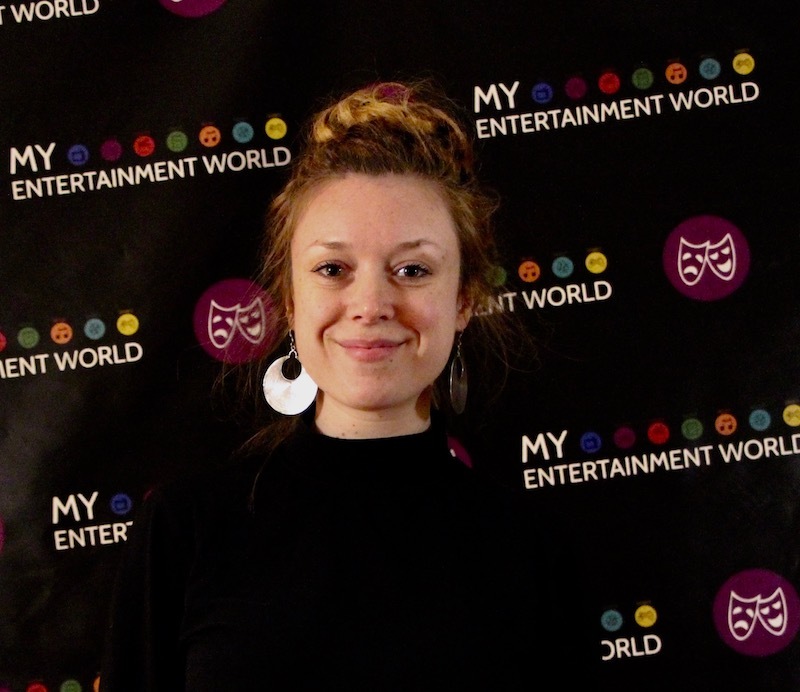 And we – myself, Mitchell Cushman, Amy Keating and, at the time, Simon Bloom, who was also a member- we were really interested in doing theatre that took place outside [spaces] you would normally see a play. I’d seen some shows in Chicago and New York that were site-specific a couple years prior that I found really, really fascinating, and really expanded the limits of what I thought theatre could do. I think that was always something that we were interested in, in terms of immersing the audience in something, and giving them a really memorable and unique experience. That is a vision that we’re honing with each show we do. We’re learning to zero in on exactly what we’re trying to do for audiences. We’ve done a bunch of shows in different places like a kindergarten classroom, or a house, and most recently, at an old funeral home. We’re always looking for what in this city we can turn into a place of art. How did you decide on TomorrowLove as a project? I think Mitchell and Rosamund Small, the playwright, had been in conversation for a while. Since Vitals [in 2014], I believe, she started creating these, for lack of a better word, vignettes. 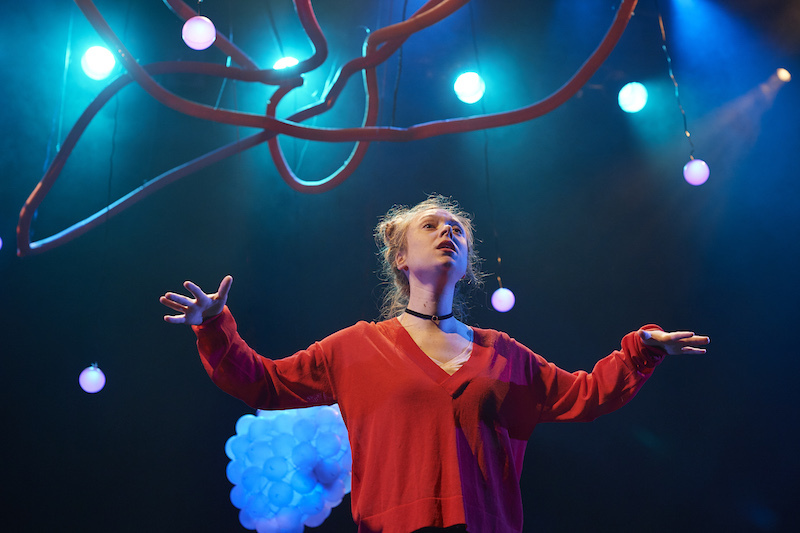 I am not totally sure about how that project really got rolling, but I know that she was just creating these scenes, and I think very organically started to see it as a whole play. And then that’s when Mitchell swooped in and thought about the different ways it could be staged. I know that he worked pretty closely with her in terms of dramaturgy, to build off that idea. So it’s something that they had been in conversation around for a while. You learned two tracks for the show. Did you read them all and choose which ones you were drawn to, or how did you decide where to go? It was an extremely complicated process. Again, I was a little bit outside of it because I stepped away from any kind of producorial [role]. I was just cast. All the actors were just cast on those tracks, and it wasn’t always to do with “oh, I think you’d be good in this scene, and I think you’d be good in this scene”- it really had more to do with the logistics around who needed to be where in order for the next scene to work. It was a very, very technical exercise. I wish I had a spreadsheet to show you. There were many colours. Just deeply confusing. I know that that was something that they spent a lot of time working out. A lot of time. How many different characters and different scenes did you play, all told? Seven scenes in total. Other actors had eight, because I was cast in a scene that was particularly long [“Paris Departure”]. I think it was like 50 minutes. So then seven characters. So it was a lot. Every track was learned by both a male and female actor. Who shared your tracks with you? That only actually coincidentally happened with me and Damien Atkins. We actually nicknamed ourself “Kathkins” because we joked around a lot. Because why not? We had the exact same track, which was awesome for the rehearsals because we got to watch each other work and build off of each other’s ideas. It wasn’t about copying each other, but it was about pooling our resources together. That was extremely helpful, I know, for me, to get to rehearse with him. But not everybody had that. It just sort of worked out that not everyone would have the exact same track as somebody else. So I rehearsed quite a bit with Damien. Does that mean you got to play opposite everybody else? I did. Sadly for me, I never got to play opposite Damien- obviously, because we were the exact same person. But Damien was the only one I never got to play with. What were some of the most interesting ways the scenes changed depending on who you were playing them with? People’s blocking would be different, so you really had to slightly, suddenly adjust to somebody else’s physical understanding of the scene. “Okay, suddenly I should be here, okay!” Your body has a memory so, when your body’s not doing that action that you’re used to, it’s harder to grab what you were doing. So, in a cool way, it really forces you to be very, very, very present. And people’s energy was always slightly different. I have one scene that I performed with Amy Keating that I would also perform with Anand [Rajaram]. And they’re so different, especially to me- Amy’s one of my really good friends, and suddenly we’re in a love scene. So trying to get out of friendship energy to be lovers was tricky, and then it was very different with Anand. Did you get much of a chance to rehearse each of the possible pairings? There were some people I ended up rehearsing with more than others. In fact, on opening night, I had my most difficult scene with a partner who we had spent the least amount of time rehearsing it. I think we hadn’t touched it in that partnership in a week and suddenly, on opening, we are doing it- to a very intimate audience of reviewers, et cetera. So it was like “oh my god. Okay. Okay, we’re doing this.” It was stressful, for sure. Very stressful. So that would happen. Because it was random, because of the way the dance was choreographed, there were certain people you would end up with a lot, and there were certain partners you would hardly ever end up with. So, a week and a half could go by, you haven’t done a scene with a particular person in ages, and then suddenly you get that scene. The randomness didn’t always mean that everything was always getting done. Did you have a scene that was your favourite? Probably one of my favourite scenes to play was Paris, which was the longest of my track. It’s a 50-minute scene and you end up having to play two different characters. You’re basically playing the character, and then you’re playing a clone of the character. So you’re playing two different characters, but they’re supposed to be the same person. That scene would just get more and more and more and more insane. It really messed with the audience, and it really messed with the actors, and it took a lot of energy to play that scene. But I really enjoyed it- it got a bit farcical, so that was fun, and I usually looked forward to that one when I randomly got it. The cast was nominated for Outstanding Ensemble. Tell us a little bit about each of those people and your experience working with them. Mayko [Nguyen] is one of my best friends, so it was fantastic working with her. I worked with her briefly, years ago, on another show- that’s where we met. But we didn’t really have any scenes together, so this was the first time for us to really sink in. We have very different processes, so it was really cool to see how she worked. That was great, to be able to see your best friend every day at work. Amy and I have done lots of stuff together, so I think we have a good vocabulary. Anand’s amazing; he’s also a really great improviser, so he could be creative a little bit around his lines, which sometimes gets stressful, but honestly, he was always so present and I really found it exciting to work with him. Everyone was great. The cast bonded, I think, pretty intensely, because the project was so massive, so terrifying, in a lot of ways, that we really worked on having each other’s backs as much as possible. Lines would get dropped, and it’s just sort of “okay, how are we going to get out of this moment where you’re drying or I’m drying? We’ve got to sit here and figure out what the next line is.” So that would happen a lot. The cast really gelled, and helped each other out. There was a lot of joking around to relieve the stress. You had to see the show at least 4 times to even see every scene, let alone the different versions of each scene. Has there been any talk about bringing it back or setting up a resident production, something that people could have the time to visit over and over again? There are some vague discussions to bring it back. I don’t have enough information to say definitively yes or no, but I know it’s in the realm of possibility, for sure. I have no idea what kind of timeline that would be, and I can’t say for sure. It’s such a massive, massive undertaking, so bringing it back would be such a huge commitment. But we had a lot of people come and see the show numerous times, which was amazing. And I think you get more out of the show if you’re able to come back. Not just because you’re seeing more scenes, but because you’re getting a richer, holistic experience. I hope it finds another life because I think a lot of people would get more out of it if they were to see it again. And again, and again. Each of the scenes is based around some scientific or futuristic concept- an extrapolation of technology that we already have, for the most part. Which of the futuristic concepts in the show do you think seems the most likely to come true? One of the scenes that I was in was about being an avatar, and being able to do something really violent, or kill someone- in fact, maybe this technology already does exist. The one where someone can do anything they want to your likeness in video form without your consent? What they did in Rogue One with Peter Cushing reminded me of that. Yeah, he was dead! So that already exists, creepily enough. I’m inclined to say the cloning. Not Death Skype; I don’t know if we’ll ever find technology for that. Never say never, who knows, but Death Skype to me was the most interesting technological future possibility. I have a hard time imagining that but I’m not necessarily super creative around technology; I don’t know anything about it. So I don’t know, maybe the cloning. What were you hoping audiences would take away from the show? To me, as much as this show is about technology, I don’t think it was trying to make any kind of “technology is good or bad” statement. It was just exploring how human beings interact with it, for better or for worse. But I also think that the show has a lot to do with intimacy, and trying to be close to someone, despite the fact that- this is going to sound bleak, but we’re all alone in some fundamental ways. But there’s something beautiful in trying to bridge the gap between my aloneness and your aloneness. So I was hoping that, if anything, this show would make people feel less alone. I think this show has a very strong beating heart to it, and I hope that it reached other people’s hearts. You’re also the co-creator and star of Stupidhead! A Musical Comedy (on stage at Theatre Passe Muraille until April 2). Tell us a little bit about that show and where it might go from here. It’s a musical comedy about growing up with dyslexia, which I did. I did the show a couple of years ago in SummerWorks and have spent a lot of time adding material. There’s new songs that Britta Johnson, who’s the musical composer, and I have worked on; there’s a lot of new stuff. I’m super scared, but you gotta do stuff that scares you. And I think there’s a lot of new and interesting stuff, so if you’ve already seen it, you won’t be “what the hell, I saw this. Why did I waste my time?” I think there’s enough new stuff that will be exciting. What else are you doing now/next? That is sort of taking up every single ounce of my focus right now. After Stupidhead, I truly don’t know. I think that we will hopefully tour it. That’s at least a conversation that we’re having. So there is a future tour possibility there. But, after Stupidhead, my slate is clean. Which I’m excited for, but also, you know, I hope it gets filled up. Just that I’m really glad that this kind of thing, My Entertainment World, exists. I’m glad that there is real engagement that’s going on in the city. I think there’s so many great things happening, so it feels really cool to be a part of that. And I’m glad that TomorrowLove is being recognized, because there’s a lot of people who put a lot of work into it, so I’m glad that they’re getting acknowledged.